IRRU has studied since 1970s the evolution of employment relations within changing economic contexts. Its specific contribution has been and continues be on the understanding of the effects of employee participation and employment governance for organizational and societal outcomes. At its origins, IRRU looked at the British 'labour problem' of union power and disorderly management. Over time, it has tackled the issues of employment flexibility, European integration, equality and diversity, and the international problem of competitive pressures eroding standards of employment most recently. Recent projects have covered non-compliance with the national living wage, the Trade Union Act, health & safety in the international garment industry, European employment policies and social dialogue, employment indicators for financial markets, labour migration regulation and Brexit. Our five decades of empirical research and theoretical reflection on the ever-changing world of work have led to two robust propositions that characterise our approach. First, the dynamic, undetermined nature of employment constrain HR strategies and in particular unilateral ones. Second, the labour market, far from working anonymously, is affected by people’s agency and its governance has major societal, economic and political implications. In other words, human resources are too serious a stake to leave them to management alone. 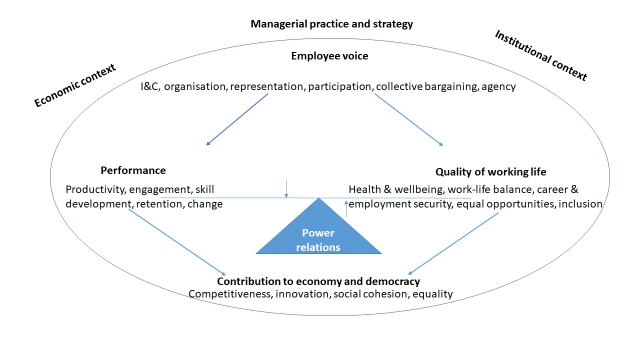 These propositions are continuously operationalised into empirical projects that have shown when and how employee voice, and its inclusion in employment policies, contributes to important outcomes such as the quality of working life (health & wellbeing, work-life balance, career and employment security, equal opportunities, social inclusion) and performance (productivity, engagement, skill development, retention, consensual change). In a global economy where work involves more and more people for more and more time, these outcomes have crucial implication for the economy and democracy. View forthcoming IRRU seminars and events.